Never tried wheat grains? Try this easy to make and tasty recipe with whole wheat grain. I've grown wheat in my garden, it grows pretty well. Try to grow some yourself, it doesn't need acres! Put the whole wheat grains (or wheat berries) in a pan with the water. Bring to a boil and boil for around 40 - 50 minutes or until the whole wheat grain is soft and easy to chew. When cooked, drain in a colander. Heat the olive oil in a pan, add the chopped onions and fry for around 5 - 8 minutes until the onions have softened. 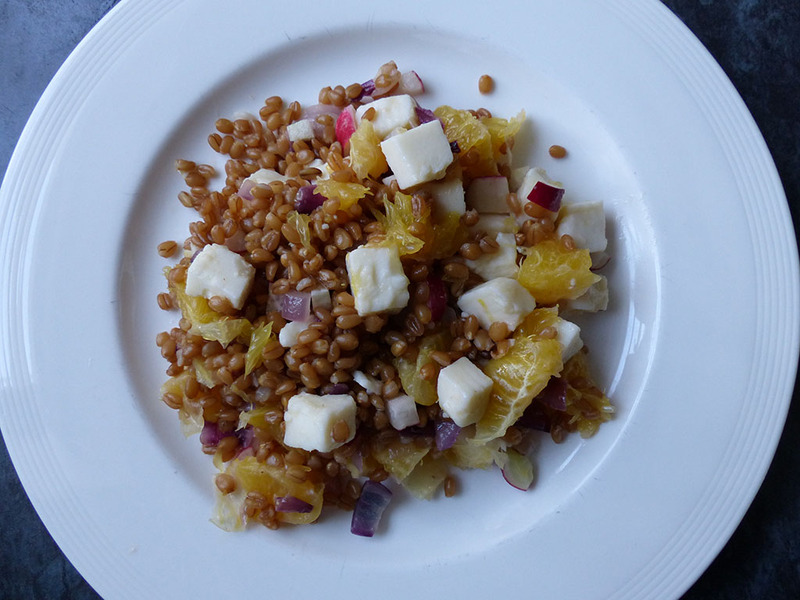 Add the whole wheat grains (wheat berries) to the onions. Also add the radishes, oranges and Bute Island Greek Style (Feta) Sheese. Combine 2tbsp olive oil, 2tbsp balsamic vinegar and 1tsp sugar. Add this to the wheat salad and mix well.